"Cut The Rope" and "Pudding Monsters": Episodes 19 and 20 of Om Nom Stories and "Cut The Rope: Time Travel" ver. 1.2 NEW Update !!! Episodes 19 and 20 of Om Nom Stories and "Cut The Rope: Time Travel" ver. 1.2 NEW Update !!! The "hidden star" in this episode is very easy to find but if you cannot find it, you can view the Answers page. This is also Puzzle No. 21 in the Puzzles page. The "hidden star" in this episode is again very easy to find but if you cannot find it, you can view the Answers page. This is also Puzzle No. 22 in the Puzzles page. Please read the comments in the screenshot above. 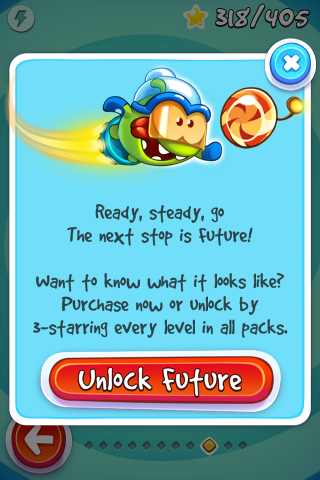 To unlock the 9th box "The Future", you can just 3-star every level in all earlier boxes or pay a small fee. There's an additional "Winter Hat" feature. Again, you can get it for free by doing the hard work (obtaining all the 40 hidden "Snow Flakes" as shown in screenshot above) or pay a small fee. 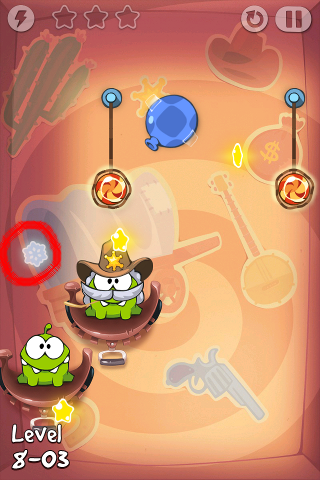 Above screenshot shows the location of the "Snow Flake" in Level 8-03 circled in red. 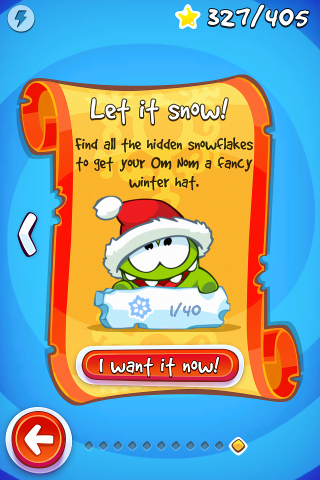 You can only collect the "Snow Flake" once, once it's collected it will disappear from the level. To successfully collect it, you have to feed the 2 candies to the 2 Om Noms and also use a candy to touch the "Snow Flake" but you don't have to collect all 3 stars. If you don't know how to clear any level, you can cheat by purchasing the "Superpowers" or view any tutorial video posted by others in YouTube, etc. To know more about the "superpower" feature, you can read this old article: "Cut The Rope: Experiments" ver. 1.4 now has "Superpowers" !